If you want to know how to remove rats permanently, it's important to realize that you've got to stop them from coming into your house, first and foremost. There's lots of rats outside, and they reproduce quickly. They're going to keep coming and coming, into your house and attic and walls, until you block their entry into your house. Stop them by finding their entry holes, and seal up those holes! Then you can trap and remove the rats. How Much Does Rat Removal Cost? After full inspection, home repairs to seal shut all entry points, and trapping and removal of rats, over 3 or so service visits, expect to pay at least $400-$500. If you need attic cleanup afterward, the price is even higher. Costs do vary by company. Remember, if anyone says they can do it for less than $300, they aren't going to do it correctly! Read what I have to say below, and make sure they follow the correct methods! If you want it done correctly and permanently, it is not cheap. That's all there is to it. The reason is because the only way to solve the problem is to follow ALL the steps below, and that means doing home repairs, sometimes extensive and costly home repairs. You will not solve the rat problem until you spend the money (or do it yourself) and get all openings into your house sealed with steel. A good professional company, especially the ones I recommend in my "Hire a Pro" section, will do it right, but DO NOT HIRE a pest control company that also does insects - they will end up costing you far more money in the long run, and they will not solve the problem. Yes, you're never going to remove all the rats until you find out how they are getting inside your house in the first place. That's what this website deals with - rats inside buildings and homes. If you want to remove rats that are simply outside, that's a whole other matter, which I'll discuss below. You must do a full inspection of the house. Instructions here: Rat Inspection and find out how they got in. Seal all entry points with steel and a sealant that stops air flow, if possible. 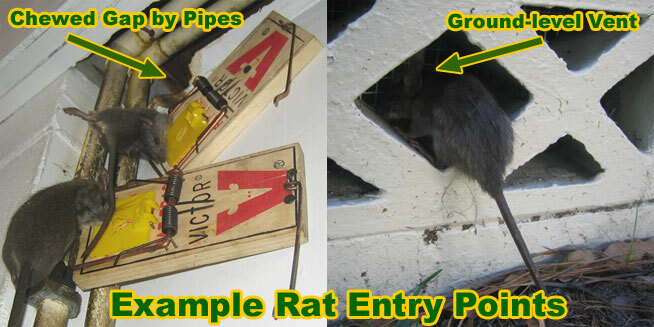 Rats like to climb up pipes to get into ceiling and attic spaces. They'll also go through ground-level vents, if not properly screened, to find a way into the house. Only after all the entry/exit holes are sealed up should you start removing the rats. To do so otherwise is a never-ending battle. Snap traps, set on the common rat runways in the affected area, is the best approach. Read all about it here: How To Trap Rats. It's important that you decontaminate and deodorize the attic after you have removed the rats for health reasons and to get rid of the pheromone scent rats leave behind, which encourages new rats to try to enter. Read more about the process: Rat Decontamination. It's kind of tough to get rid of the friendly neighborhood rats outside and in your yard or on your property. As usual, if the habitat supports them, that is, they have adequate food, water, and shelter, then they're going to thrive. Presumably you've followed the above advice and you've denied them shelter, by sealing off your home. But why do you still have rats outside? Where are they getting shelter? One short answer is that they might be living in your neighbor's house! Rats actually don't venture out very far from where they live. In fact, they stay in a very narrow range. The home range of a rat is usually less than an acre, often less than a quarter acre! So if you have rats in your yard, they are definitely living very close by. Check your house again! Or your shed or your next-door neighbor's house. So once again, it all comes down to eliminating their hiding spots, and denying them shelter. That said, you can also deny them food sources and other shelter sources by eliminating garbage, debris, pet food, bird food, crops, etc from your property. Although I wrote this site with rats in mind, such as the Roof Rat and Norway Rat, the same principles apply to other rodents, such as the house mouse. Mice behave very similarly to rats, they're just smaller. Email me if you have any questions about mouse removal, how to remove mice, rodent removal, other queries. 1) how to catch a rat in the attic - Once the entry holes are sealed, set rat-sized snap traps on the rat runways, bait with peanut butter. 2) rats in chimney - I don't really see this too often, but it can happen. Cap the chimney with a steel cap, and trap the rats with snap traps. 3) rodent traps - There are many kinds, from cage traps to glue boards, but lethal snap traps are the best. 4) mouse trapping tips - Pretty much the same as rats, except use smaller traps, and lots of them. Mice are easier to trap than rats. 5) rat eviction fluid - No such thing, how did you even come up with that concept. Rat removal prices are more at than trying to buy a repellent, but real methods actually work, and you save money over trying to buy gimmicks. 6) how to catch a rat - I cover this topic thoroughly, just click on the link on the left nav bar. 7) rat deterrent - The best deterrent is a house in which every open gap has been sealed shut. 8) Norway Rat poop - It's a little bigger than Roof Rat poop. It's basically longer and fatter. You know, bigger. Other than that, it looks the same. 9) trapping rats in attic - It's easy if you set the traps right on the rat trails, which are easy to spot to the trained eye. 10) trapping a rat - Best done with a snap trap. 11) rats and nests - Rats do create nests in attics, sometimes made out of leaves and debris, sometimes insulation. 12) rat roof keep off - You can't keep rats off the roof! They can climb anything. They actually have sticky feet, and can run sideways along walls. 13) rat repellent moth balls - A bogus myth! If you use mothballs, all you'll do is poison the environment and not affect rats. 14) rat feces disease - Several infectious diseases are linked to rat feces. 15) mouse disease - Several infectious diseases are linked to mice. 16) pictures and information about mice - Lots of it on this website, oh lots of it. 17) removing mouse from your house - If it's inside the home proper, you can try to net it or club it, but a BB gun actually works best. 18) mice in the chimney - Don't start a fire. Make sure you cap the chimney and trap the mice. 19) mice in homes - Happens all the time. Mice love to live in homes for shelter and warmth. 20) tips on trapping a mouse - Use snap traps, and set them on the mouse trails in the attic or home - bait with peanut butter. 21) mouse repellant - No such thing! Go ahead and try everything! Then do the job right when you discover that repellents don't keep mice away! 22) mouse removal from residence - In a private residence, you can do it yourself, or you can hire a private company to do it. 23) mouse on roof - Mice climb on the roof, usually to get into a vent or eave gap into the attic. 24) rat urine smell - It kind of smells like the urine of other animals, just a bit more ...ratty, I guess. 25) sick rat symptoms - Interesting! I'm not sure, but I'm guessing lethargy is a sign, maybe erratic movements. 26) rat relocation distance - I actually don't advocate live trapping and relocation of rats. They'll probably die anyway. But if you must, I'd say at least three miles. 27) rat prevention - An important topic. Keep your yard trash-free, don't let fruit hit the ground, and seal openings into your house. 28) remove rats from garage - Interesting, rats in the garage. Yes, rats do get into the garage, and the garage door can be hard to seal shut. Get a new seal on the bottom of the door, and set rat traps in the garage. 29) law on trapping rat - I don't think there are any rat trapping laws or legal concerns or licensing needed to trap rats. But you definitely need a permit to apply poison. 30) human wildlife removal mouse - I don't quite follow what is being asked here. 31) how to get mice out of fireplace chimney - Set a bunch of mousetraps. 32) how to capture a rat that lives in my attic house - Capture a rat with snap traps - glue boards are a really bad way to do it. 33) how to get rats out of the garden - There is, unfortunately, no way to keep rats out of the garden, outside of some serious fencing. But an outdoor cat or two will definitely help! 34) rodent in the garage trapping tips - Set the traps along the garage wall, because rodents like to travel along edges. Check the corners of the garage doors for openings, and seal those shut. 35) can mouse in attic chew through ceiling - Yes, a rat or mouse can chew through the ceiling and into the house. It does happen, but not terribly often. 36) baby mouse sounds - Mice do sometimes make squeaking sounds in the attic, like little high pitched chirps or squeaks. 37) NYC subway rodent removal - Now here's one place where even I can't get rid of the rats! Rats will always live in the New York City Subways, until the end of time and beyond. 38) where can you get a trap for an rodent in the attic - Most hardware stores or department stores, even, will sell mouse traps and rat traps. 39) where are rats getting into my house - Ah, that's the million dollar question. You've got to inspect every eave, every vent, the roof, everything. 40) what to do with caught mouse - If it's dead, throw it in the garbage. If it's alive, let it go outside. 41) what to do when there is rodent in your attic at night - Who you gonna call? Rat Busters! 42) what to do when a rat is in the garden - Get a cat, I think. No way to keep rats out of the yard or garden. But you can limit their numbers by denying shelter. Seal up your house, get rid of debris. 43) what to do if rats get in the garage - Find the entry hole, probably at the corner of the garage door, and seal it. Set rat traps. 44) what to do after a mouse gets into an attic - Don't panic. Seal up all mouse holes leading inside the house, and set mousetraps up in the attic. 45) what should i do if there is a rat in my loft - The standard rat in atic procedures apply here. 46) what rats don't like - Rats like to hide. They don't like any animal bigger than them. 47) what kind of bait is used for catching a rat - Bait doesn't really matter. I like peanut butter, but a variety of foods, from meat to candy to chocolate to fruit will work. 48) what is a mouse doing in the garage - It's probably seeking out shelter, of course. 49) what does a baby rat sound like - A baby rat can make high pitched squeaking noises. They are very quiet though, so most people don't hear them. 50) what do rats live in - Everything. Loft, Maze, Nest, Oven, Pantry, Pipes, Runway, Sink, Toilet, Vent, Woodpile, White House, Yard, and Zoo! 51) types of rat removal methods - There are many methods, but I outline the simple and best rodent removal method - seal the holes, then trap the rats. 52) mouse trapping techniques - The best technique is to set the traps in the difficult-to-reach areas where mice actually run about. 53) remove mice from plumbing pipes - Water in the pipes helps, so seal off any inactive pipes. 54) release a rat - If you want to, do it, but it probably won't survive for long. 55) mice in crawl spaces of house - Yes, that happens. Find out how they are getting in, then you can stop them. 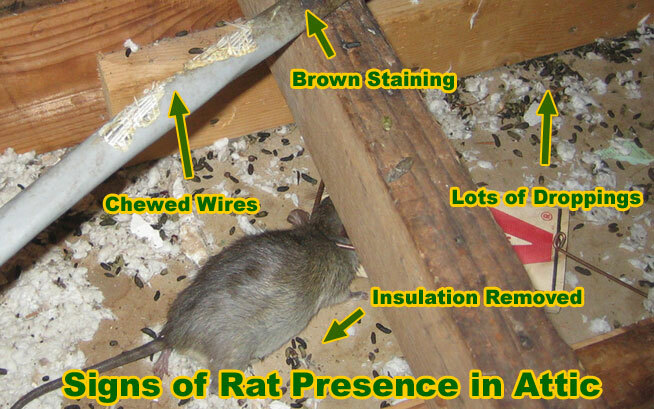 56) mice in attic removal - A complicated job, one that I do recommend hiring a pro to do. 57) mouse repelent - Definitely no such thing, at least one that actually works, that is. There are plenty of ineffective mouse repellents for sale. IS THERE A RAT REMOVAL COMPANY NEAR ME? Yes, almost certainly. I myself have spent many years compiling a list of 600+ areas that have a professional wildlife and rat removal company that takes the correct approach to rat removal and control. Just click on my "Hire a Pro" page. The price for rat removal will vary, but a wildlife control company is definitely your best value.